Vinyl water bag is double sealed for durability, and has 20 lb. capacity marked in 2 lb. increments. Includes universal sized, heavy duty head halter with metal support rings and Velcro closure, vinyl weight bag, over door clamp, pulley assembly, adjustable 12" spreader bar, 8" traction rope, and "S" hook. Safe for treating back pain. 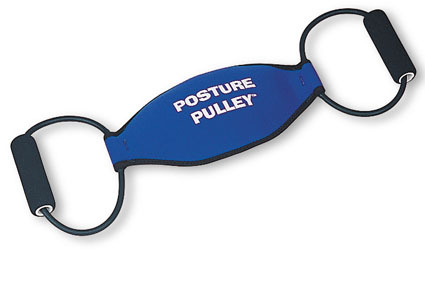 Reduces muscle tension from everyday stress and improves flexibility. Compact design fits virtually anywhere. Adjustable angles maximize effectiveness. 61 lbs. 300 lb. weight capacity. Strengthens weaker anterior neck flexors, while retracting the skull. Isolates and strengthens posterior head stabilization muscles. 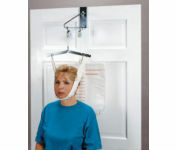 Reinforces anatomically correct head and neck posture. 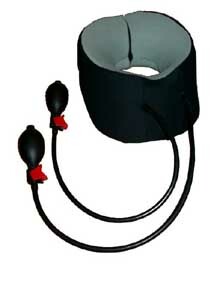 Gets to the cause of neck stiffness & discomfort fast. Patented up & down motion promotes disc lubrication & joint nutrition. 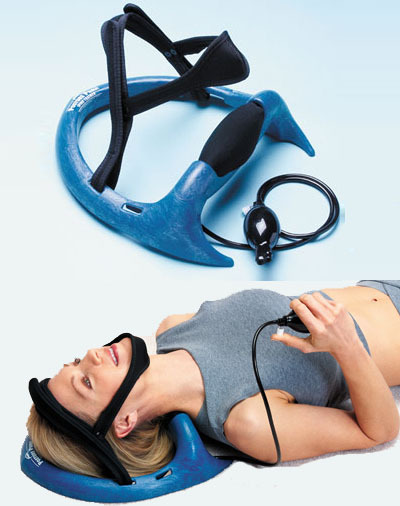 Dramatically reinforces the cervical curve. Lightweight, portable, easy to operate & travel with. Beautifully crafted, made in the USA and built to last. Used in over 500,000 cases worldwide. Relieves back stiffness and discomfort. Dual inflation mechanism gradually lifts, stretches and separates the joints. Two uniquely angled air cells create multi-vectored force and promote disc & joint lubrication. 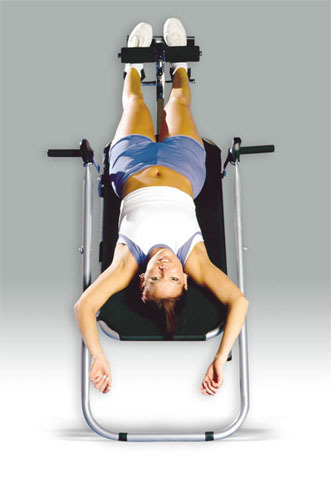 Built-in Rocking Mechanism allows you to excercise your abdominal muscles while shaping and stretching the lower back. Saunders Cervical HomeTrac allows patients to have the same quality of care at home as they had in the clinic. 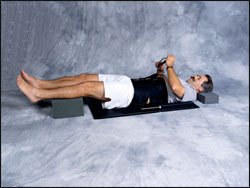 Traction is provided in the supine position to help the patient relax and to reduce neck muscle activity. Directs traction forces towards the occiput ( back of the head ) thereby preventing compression of the TMJ through the chin. Adjustable extension foot allows for traction angles of 15, 20 or 25 degrees. Pressure valve limits the amount of force that can be developed and transmitted to the user to enhance safety. The Deluxe Model has self-adjusting neck wedges that rotate through a 30-degree arc and are removable for easy cleaning or replacement. The rotation of the neck wedges combined with the ability to adjust the width ensure that even patients with extra large or extra small neck can achieve a perfect fit! First home pneumatic traction device specifically designed to deliver up to 200 lbs. of force. Patented pneumatic pump, non-slip belts, and an easy to read force gauge ensure safety and comfort. 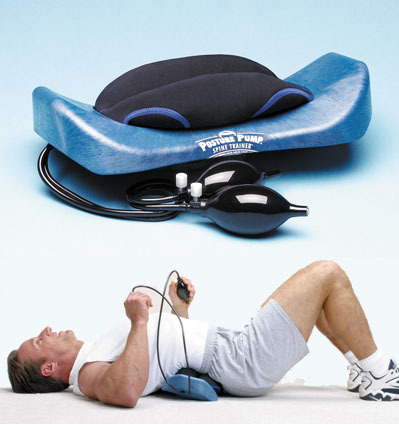 Lumbar traction is delivered in either the supine or prone position. 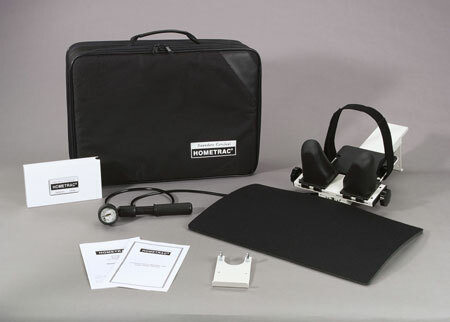 Portability greatly enhances patient compliance and satisfaction. Offers a friction-free actively moving surface for efficient, effective traction pull. Ensures safety - user has total control of force at all times. Provides a convenient and cost-effective option to continuing clinical traction treatments. Folds for easy storage, weighs only 22 lbs. Includes user's guide and deluxe carrying case. 23" X 24" X 3"
Injection molded bed design features "Flex Technology" allowing backrest to bend and accommodate stretches for greater mobility and range of motion. Corner feet increase the A-frame base by 20%, reduce sliding on hard surfaces and protect floors. Adjustable tether strap allows user to preset angle before inverting. 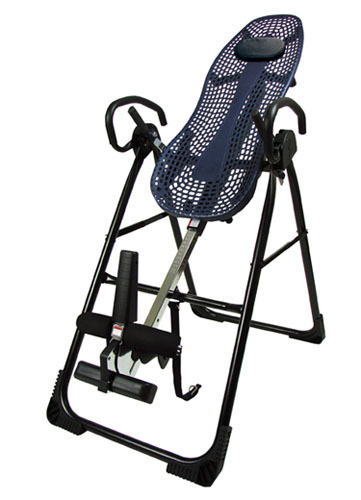 Features an adjustable head pillow, adjustable foot platform with two settings and a full inversion option. Auto locking hinges secure bed frame from disconnecting from base for portability and security. Specialized pivot bearings for a lifetime of squeak-free rotation. Adjustable roller hinges with cam locks offer added stability and choice of three rates of rotation. Derattler knob reduces shifting for smooth quiet rotation. Injection coated rubber hand grips for added durability. Scratch resistant powder coating and triple-plated chrome. Curved front ankle clamps for greater comfort and security. Easily folds for storage to 28" X 16" X 66" (71 cm X 41 cm X 168 cm). Includes laminated owner's manual and instructional DVD. Portable and lightweight traction collar inflates with dual bulbs to gently stretch and relax muscles slightly for pain relief. Developed by orthopedic engineers for comfortable, effective daily treatment. Collar is constructed from plastic foam, internal inflatable bladders contain natural rubber latex. 97% cotton and 3% Lycra fabric covering can be removed and cleaned with warm water and mild soap. For professional and home use. Does not require assembly or batteries. Fastens easily with buckles. Includes carrying case.